This elegant 4 star hotel is located in the southern side of the resort and about 200 metres from the sandy beach. 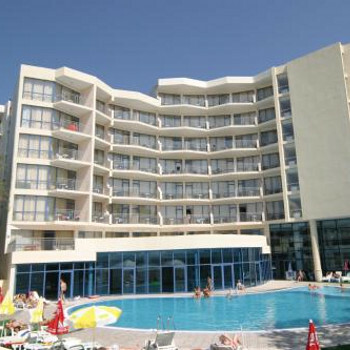 The hotel offers a pleasant atmosphere with modern architecture and facilities. here we go the food is an absolute joke eggs eggs eggs for breakfast yes ok smoked sausage cereal but after a couple of days of this your stomach and bottom tell you its time for a change.dinner is a waste of time its rice hard potatos salad that is all mixed in some kind of sauce probably to disguise its age,beef that smells as does the chicken ok the deserts are ok but too much sugar in them,tea is the same as dinner really so after a while the potatos break the plates and the rice goes brown.its o total shame really as the hotel is great its just the people who run it you make a complaint to your rep and she just gives you some arrogant answer.we eventually had our sheets changed after 11 days but the towels didnt so on our last day i had a shower with a hand towel.the staff are totally ignorant especilly the bar staff if you are eastern european you are ok.the only staff that are any good are the animation team what a laugh they are in fact they made our kids so welcome it made us overlook all the other rubbish what was happening.so all in all it was just a good job we had a decent amount of money with us coz we had to eat out most of the time oh yes and by the way the beer ran out twice laughable just another nail in this hotels coffin.please save yourself some aggro and book to go to another hotel.im just so upset that noone else flies to golden sands as we all love it and balkan dont exactly have the best airline fleet or the best choice of hotels,maybe soon i live in hope. save your money please this hotel is rubbish seriously,the staff are so ignorant they just dont care unles you are eastern european then you get what you want even the food is for them i know we are in bulgaria we have been loads of times before and the people have always been fantastic in the hotels as well as out.we were in the pool one day when my daughter said come and look at this at the bottom of the pool so off i go down to the bottom ,come up for air not believing for one second what ive just seen so we get a plastic beaker and yes it was it was a turd so i gave it to the lifeguard and he just shrugs his shoulders no thanks nor nothing,that was one occasion so we carry on trying to overcome the situation then lo and beholh i cut my foot on a loose tile i just cant understand this is supposed to be a 4 star hotel its a total sham please go somewhere else dont waste your money find another hotel,please dont bocott the counrty the place is great its just every now and then you get these disaster holes.please read my other report i forgot to mark the staff if i could id give them zero except of course the animation team they were BRILLIANT!!!! we were all inclusive with breakfast at 7.30-9.30, lunch 12-2.30, and dinner 6.9.30, pork burgers, pancakes, biscuts and oranges were served as snacks, this was ment to be served up to 11pm but snacks stopped at 5pm. the hotel was very clean and well maintained with a large lobby with leather sofas and chairs, a bar and reception, on the 1st floor a bar and another seating area, the rooms were spacious and we had a great veiw of the pool and the sea from the 5th floor, the food was not really nice and repetitive but well displayed and the dining room was clean with self serve tea/coffee and juice, bar was also avalible. it is located 3 minuite walk from party street with bars resterants and shops and stalls, when the windows were closed you could not here a thing from outside. the staff were friendly expecially bobby the lady who served all the food she was lovely,the bar staff got continually harrases as only one serving at a time for all the guests witch lead to quiet a wait for a drink, better ordering a couple at a time, there was a kids club with lovely girls but mainly aimed at under 5yrs old, there was a fokelore show friday for a half hour,and a dancing show sat night for 40 mins, that was all the entertainment. all in all this hotel was nice and we had a plesent stay but wished there was more for our 12yr old to do..